The National Quality Forum (NQF) is pleased to publish “Measurement Systems: A Framework for Next Generation Measurement of Quality in Healthcare”. The United States is at a critical juncture in the transformation of how it pays for healthcare. Numerous healthcare stakeholders are transforming the U.S. health system by championing efforts to move from volume to value-based care. Value-based purchasing (VBP) approaches, including alternative payment models, serve as key mechanisms for this transition and performance measures form the crucial building blocks of these mechanisms. As the lens of performance measurement widens to examine quality in specific settings and conditions, the comprehensive relationship of the grouped measures offers greater potential to assess quality than the current measure-by-measure paradigm. Additionally, the expanding number of individual performance measures has substantially increased the burden associated with measurement, undermining the promise of value-based care. 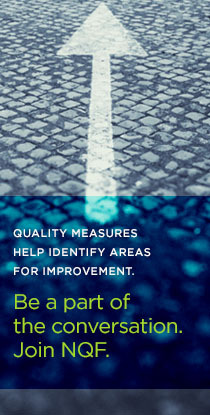 In response to these concerns, NQF launched a project in 2018 to explore how measure sets and measurement systems can advance performance measurement objectives while increasing transparency and minimizing burden. Collectively, the multistakeholder review offers significant potential for broader alignment, reductions in unintended burden, and accelerated VBP adoption. The full findings and recommendations from this project are detailed in the white paper, “Measurement Systems: A Framework for Next Generation Measurement of Quality in Healthcare”. In the coming weeks, NQF will initiate a technical expert panel to develop best practices for measure sets and measurement systems to build on this initial phase.